This park has a theme of ‘Play with nature, learn about nature, co-exist with nature’. It has more than 50 types of cherry blossom trees amongst which the goshiki sakura (five-colour cherry tree) is the most beautiful. Elsewhere are tulips, cosmos and other flowers to seasonally enjoy. 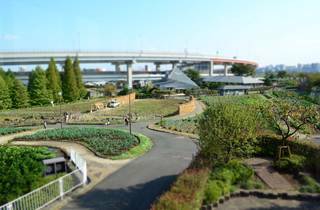 There is also an environmental centre, making it a popular sightseeing spot in Adachi ward.